Made In America's Flagship Store in Elma Invites Groups to Enjoy Our All American Hospitality! Located next door to the original store location that opened in 2010, the new Made in America Store – the company’s flagship – was custom-designed to offer groups a complete hospitality experience. The hospitality suite is adjacent to our kitchen and home section of the store. Shopping is on one-level, with two at-grade entrances (one is specially designated for groups). Featuring a brand new dining amenity, the store now has an indoor dining room with the largest privately-owned mural of the U.S. Constitution on display. Comfortably seating 60 persons inside, additional seating is offered from May through October outdoors. In response to motor coach groups utilizing our store as an en route rest and snack stop, we have added a ladies’ restroom with six stalls, separate, free motor coach parking, and dumping facilities right across the street. Coaches can even purchase diesel fuel, obtain light maintenance service, and utilize a vehicle wash next door. Called “Picnic on the Porch,” our guests enjoy meals that are freshly made by Chef Mike in his farm-to-table kitchen on wheels. 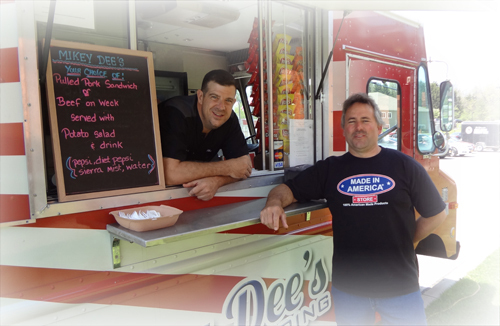 Groups can choose to order their meals at the food truck window, or have it served as a catered meal in our hospitality suite. With meal prices at $10, including tax and gratuity, groups have thoroughly enjoyed this new amenity. Meal entrees are inspired by food favorites for which Buffalo is famous. Seasonal meal deals during the months of March, April, May, September, and October. Groups of every size are welcome. With a 10-person minimum, we offer a 10% discount and complimentary souvenir. A step-on welcome is provided by the store founder/CEO, Mark Andol, or a manager. We are happy to secure the services of an ASL signer for groups that are hearing impaired or deaf. NOTE: Dorothy will contact you by phone and/or e-mail in 1 to 3 business days to confirm your reservation. If this contact form does not work for you, you may fill out the basic form below. Please include all information about your donation needs and event in the Comments/Questions section. 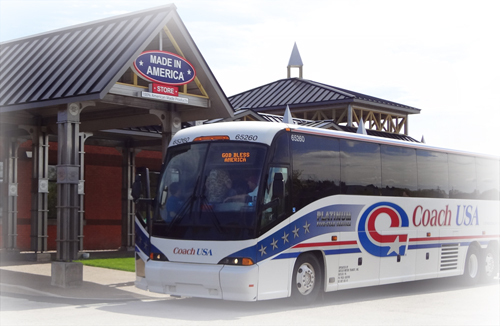 "I stopped into the Made In America Store last Saturday with my Motorcoach Group on our way back from a Maine Trip. All my passengers, myself included, thought your store visit was one of the best parts of our tour. Everyone associated with the store was very welcoming, warm and true. We love your gig you've got going. It feels good in the heart to see you succeed. God bless." Together, we can save and create U.S. manufacturing jobs that enable Americans to support themselves and their families.